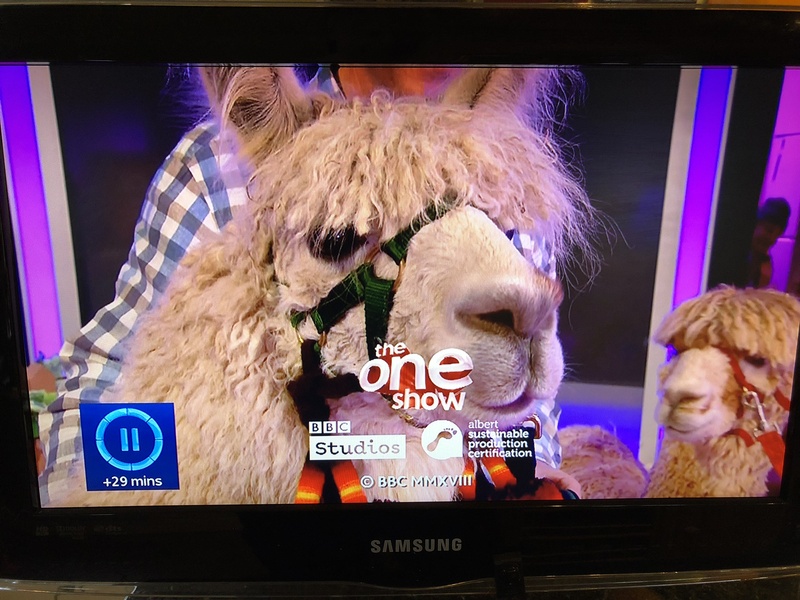 Home » News » Blog » Llama at The One Show (and an alpaca). 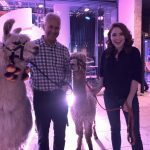 Llama at The One Show (and an alpaca). 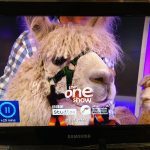 Llama at The One Show? 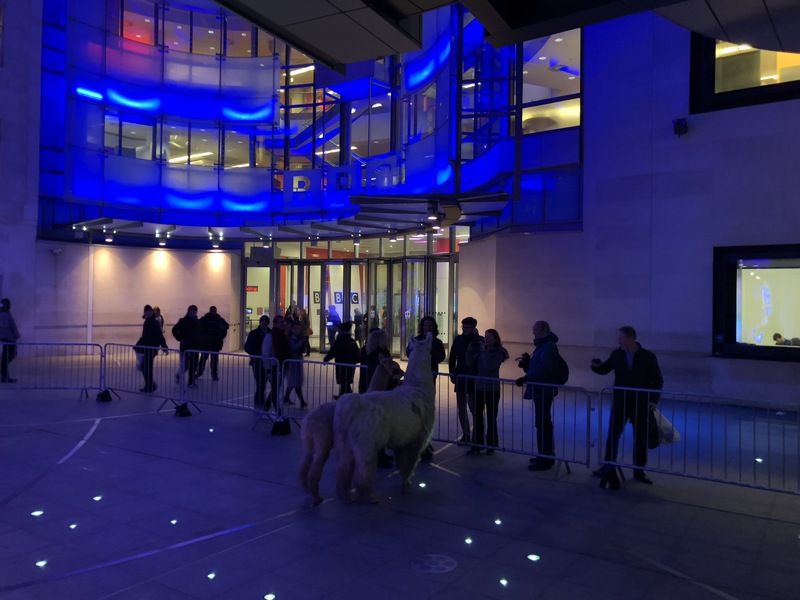 We got the call at 8pm the evening before – can you bring llamas to The One Show to be broadcast live on Thursday 25th January 2018? 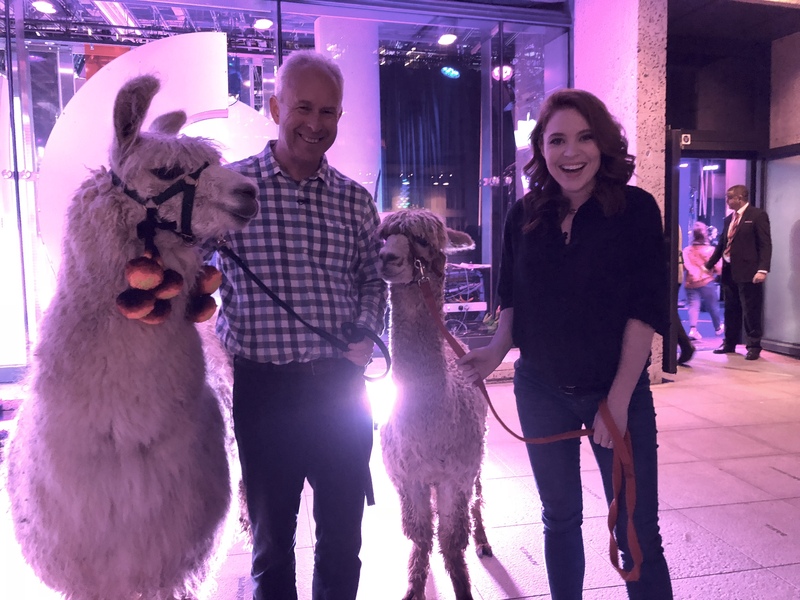 Well the answer is we could bring a llama but would need to bring companions and they would need to be alpacas. This was agreed whilst we were eating a Chinese meal in London. Thursday dawned and reality set in. We would need to set off at 2:30pm to get to BBC Broadcasting House by the required 5pm. 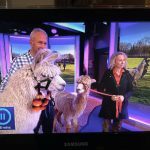 With just one llama we could take, we would need to take companions and therefore loaded our van with 6 hurdles (just in case), feed, water and Eron (the llama), Obelix, Mr Knightly and Oberon. We just made it through London traffic arriving at 4.55pm and met up with the team from The One Show. Whilst the boys took a breather from travelling with hay and water, we went up to the 7th floor to wait our call for a test run. 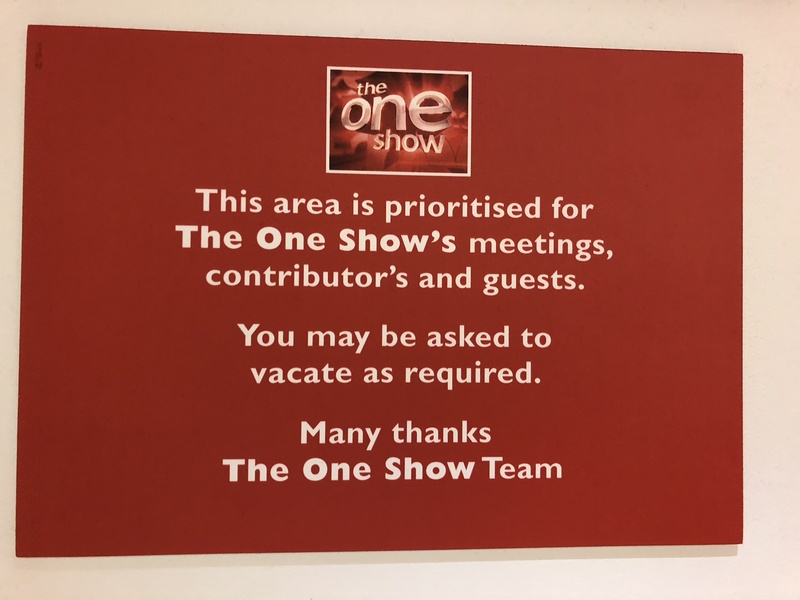 The One Show guest area. After an hour we were called down to the studio where we met more of The One Show team including Matt Baker and Angela Scanlon where we chatted for a few minutes as a dress rehearsal. The idea was a short Q+A session at the end of the live show tying in to a series on ITV hosted by Julia Bradbury on great walks in the UK. We then left the studio to get Eron and Obelix ready for their big moment. 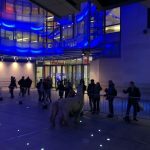 By now the temperature had dropped to around freezing but the boys were completely chilled and happy to meet and greet members of the public outside the studio. 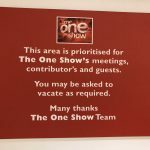 The One Show goes out live from 7pm to 7:30pm. We were ready and waiting but only got the call at just before 7:30pm. 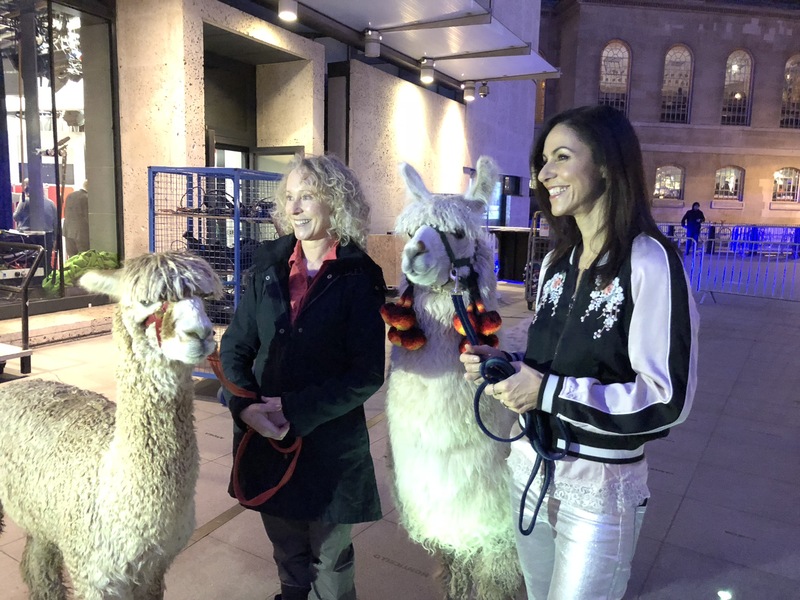 We walked in with Eron and Obelix who were about as chilled as any camelid can be – certainly more so than us! Matt and Vicki had a short chat and then it was closing credits so we were off! 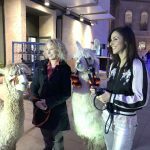 We went outside and were soon joined by Angela Scanlon who poised for pics with Eron and Obelix and then by Julia Bradbury for more pics and selfies! We were also joined by the Nordic walkers and members of the public and it was pretty obvious that Eron and Obelix were naturals when it came to the camera! We loaded up at 8:30pm and were home at 10:20pm after a very grand day out! 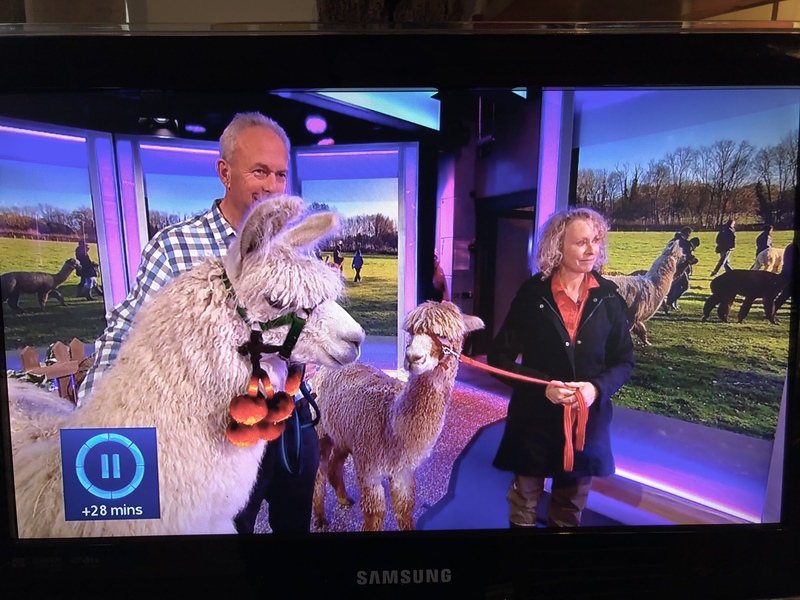 Poor Mr Knightly and Obelix however didn’t get onto the show as there wasn’t enough room in the studio – so probably didn’t have the best of days…but their time will come!